Pimple rubbers - which one can give you an advantage? Have you often thought about trying pimple table tennis rubbers, to see if they would improve your game, but you were never sure which one to try? Do you want to add something different to your game or style, to give you new options and strategies? Do you need some trickier equipment to help beat these fast juniors that blast the balls past you? If the answers to any of these questions is YES, than a pimple rubber is worth considering, and this guide will hopefully help you pick the most suitable one. As an example I've used the TSP range of pimples, as TSP specialises in pimple rubbers, and have the full range, from the longest pimples for defensive styles, to the shortest and grippiest for offensive styles. TSP are among the most widely used pimple rubbers, especially among the Elite levels where TSP pimples are by far the most common. Most other brands do also have pimple rubbers, but not always of the same quality or consistancy, not the full range. How are pimple table tennis rubbers different? Because pimple rubbers grip the ball differently, a serve or return with a pimple rubber will require your opponent to make some adjustments, and if they're unable to do so, it can force weak returns or errors, which you can obviously take advantage of. Of course there are some drawbacks of pimple rubbers as well, but if you can learn to deal with these, and your opponent cannot adjust to the different properties of your rubber, you can gain a tactical advantage, which let you beat players you normally may not be able to beat. There will be some adjustments in strokes required on your part, and particularly for long pimples learning some strokes which you may not have learned or used as yet, so be prepared to put in a little work before you can see the payoff. 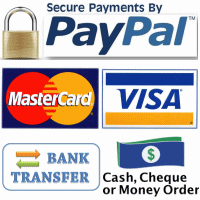 Below is a list of the different types of pimple rubbers. For each one I'll try and describe the style that it's most suitable for, and the type of blade that's most commonly used on. In general the longest and thinnest pimples are the best at controlling high spin and absorbing high speed balls, while the shorter and wider pimples are best at creating high spin and hitting through spinny loops at high speed. Long pimples are the most defensive style pimples and are most commonly used for chopping away from the table against loops, returning very heavy backspin or 'dead' balls, or are used close-in for a blocking/pushing style game. Because long pimple have the most spin reversal and are generally slow, they offer the most disruptive (to your opponent) style game, but also require the biggest adjustment in strokes. These rubbers are usually used to either draw a mistake from your opponent, or to setup the ball for a powerful finishing stroke with the inverted side. They are most effective when used on a stiff blade with a spinny inverted rubbers on the other side, offering the most contrast between the two sides. TSP Curl P-1r - a soft and grippy long pimple with a dense sponge, for chopping against loops from mid to long distance from the table, with the ability to return very high level of backspin. Most commonly used with sponge on a stiff blade. This is the most famous long pimple rubber, used pimple by modern defenders at the elite levels, inlcuding players like Joo Sae Hyuk. TSP Curl P-4 Chop - a soft grippy long pimple with a very soft sponge, for chopping against loops from mid to long distance from the table, with the ability to return very high levels of backspin, with a little more ability to add your own spin compared to P1-r, but slightly less backspin off loops. Most commonly used with sponge on a stiff blade. TSP Curl P-H - firm, grippy and slow long pimples, for a disruptive and aggressive attacking 'close to the table' style game. Can generate significant amount of spin so topspin can be counterhit with some topspin. Can produce very heavy backspin on pushes, and can attack fast, similar to 'hardbat' style attacks. Used in both OX and with sponge on a stiff blade. 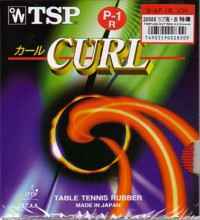 TSP Curl P-3αr - a lower grip and medium hardness pimples, most suitable for a close-to-the-table blocking / pushing style game. This pimple is medium pace with good reversal, so loops can be blocked or chop-blocked to return a short backspin ball. Your opponent's backspin balls can easily be attacked as it reverses into topspin. Most commonly used in OX with a blade with hard outer ply. Medium pimples, sometimes called half-long pimples, have properties that are somewhere in between those of long and short, offering some of the more disruptive and spin reversal properties of long pimples, and also some of the more offensive properties of short pimples. Useful for players that play both styles, but most commonly used for a more offensive style close-in like that used for short pimple, where they offer more disruption while sacrificing some speed potential. TSP Curl P-2 - wider and medium pip that is fairly slow. More versatile and can be used for a high control chopping game or a more aggressive attacking game. Not as much spin reversal as long pimple but it offers high control and tends to scrub off the spin. Usually used with some sponge on a stiff blade but can be used on a variety of blades. TSP Milli Tall II - skinny and closely spaced medium pimples with high grip, slow and good spin generating ability for a medium pip. More versatile and can be used for a high control chopping game or a more aggressive attacking game. A little more bouncy and lively compared to the P-2, which more ability to add spin but more sensitive to spin. Usually used with some sponge, can be used on a variety of blades. Short pimples are the most offensive style rubbers, as they are relatively insensitive to incoming spin, and when used for hitting almost all the power of your stroke is used for speed, so they can be even more powerful than inverted. When hitting or blocking with short pimple, they offer a different combination of speed and spin to your opponent compared to inverted, so unless your opponnets adjusts to this, it can draw weak balls or mistakes. Short pimple are almost always used close-in for a fast game, and the ball hit at the top of the bounce which offer the lowest risk and offers your opponent less time to react. These rubbers are most commonly used on a stiff blade and combined with an inverted rubber on the other side, offering some contrast. TSP Spectol - a more traditional-type short pimple, very good for fast blocking and hitting through spin. Fairly low grip, so quite insensitive to spin. However the soft sponge allows you to dig the ball in easily for more grip, which can be great for flicking short balls. Most commonly used on the backhand for an aggressive blocking / counter-hitting style game close to the table. In recent years 2 new variants were added, one with the softer Spectol 21 Offensive Sponge for more spin ability, and one with the firmer Spectol Speed Sponge for even more speed. Spectol pimples are one of the most commonly used rubbers on the backhand by fast and offensive players. TSP Super Spinpips - Wide and soft high spin pimples, allowing you to add very good spin (almost that of an inverted rubber) while still getting some of the benefits of a short pimple rubber. The high grip allows you more spin on serves, and gives more 'lift' for flicks and topspin attack. You can even loop with this rubber, although the throw is quite low, so you need to open up the bat more. In recent years two new variants were added, the Super Spinpips 21 with the more lively and soft [i]21 sponge[/i], and Super Spinpips Chop the one with a harder [i]Chop Sponge[/i], more suitable for mixing up attack with defense. The new Super Spinpips Chop 2 has just been released (2013) which has a slow but very soft sponge, allowing you to absorb pace and add even more spin. TSP Tyranno - a very fast short pimple with a good spin ability, for a fast attacking style game. The fast and lively sponge adds more spin, and more suitable to fast forehand attacking style game. Most suitable for a stiff offensive blade. Of course pimple rubbers are not for everyone. Some people love them and go from strength to strenght, while others may find it does not really suit them, or they're unable to make the adjustments in strokes. There's one thing in common among those that do or don't like them though... they've all learned a lot more about pimple rubbers by trying them, so even though you might not like using them and have changed back to inverted rubbers, next time you face a pimple player opponent, you'll be a lot better prepared!